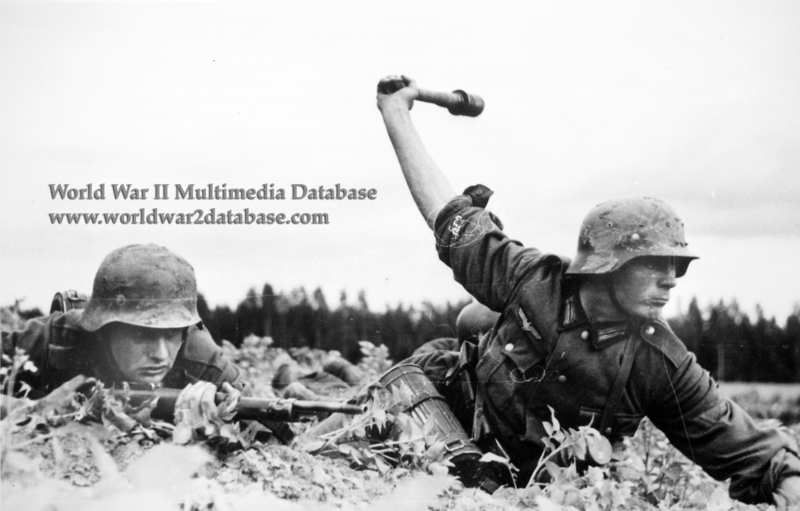 Deutsche Heer Obergefreiter (German Army Senior Lance-Corporal) prepares to throw a Model 24 Stielhandgranate (Stick Hand Grenade) while he is covered by another Gefreiter (Private) with a Mauser Karabiner 98 Kurz (Model 1898 Kurz Carbine) in a staged propaganda photo during invasion of the Soviet Union. The Model 24 grenade and the Mauser 98k are ubiquitous and famous German infantry weapons. Both soldiers have Model 1938 gas mask canisters. The Model 24 Stielhandgranate had a hollow wooden handle and required the fuse to be set before it could be operated. Greandes were shipped without fuses and were assembled before battle. Seven grenades could be tied together to form a charge to blow throw barbed wire or light defenses. The Karabiner 98k was introduced in 1935, replacing the Gewehr 98, the Mauser rifle used in World War I. Germany manufactured 14.6 million Karabiner 98k rifles during World War II. Despite attempts to replace it with faster-firing automatic weapons, the Karabiner 98k served as the standard German infantry weapon throughout the war.